"Variety is the spice of life" applies to food, too, so broaden your diet (and get healthier in the process) by introducing these unusual foods into your kitchen. Admit it, sometimes when you're dieting, your meals can get as predictable as a January gym rush. Not that there's anything wrong with chicken, brown rice, broccoli, and olive oil. It's just that the more monotonous your diet, the easier it gets to justify cheat meals. You don't do the exact same workout day after day, week after week, so why eat the same meals all the time? Make this the year you explore new foods, just like you search out new exercises. Here are four unusual foods to get you started. It's rare to find a strength athlete who doesn't wax poetic about protein. Eating enough protein during the day is essential to building new muscle. But eating protein doesn't automatically have to mean eating chicken breast. It's time to branch out and give rabbit a chance. The French and Italians make rabbit a regular part of their diet, along with beef, chicken, and pork. With 22 grams of protein and 6 grams of fat in a 4-ounce serving, rabbit has all the amino acids your muscles need. It also has more than a day's requirement for vitamin B12, which your body needs to maintain proper metabolism and nervous system functioning. And it provides a good dose of selenium. Rabbit has a richer flavor than chicken, but doesn't taste gamey. Rabbits raised for meat require smaller inputs of land, water, and feed than what's generally needed for poultry, pork, or beef production. Farmers don't generally use antibiotics in rabbit farming, and rabbit meat is usually farm raised, not wild. Thanks to increasing demand for alternative meats, you can now find rabbit at well-stocked butcher counters, some farmers' markets, and grocers specializing in European foods. How to Prepare: Because the ratio of meat to bone is high, you can roast a gutted whole rabbit like you would a whole chicken. The easiest way to use rabbit is to add it in chunks to familiar dishes like chili, pasta meat sauce, soups, and stews. You may also come across rabbit sausage, a leaner and delicious alternative to the pork variety. The Middle Eastern food called freekeh is an ancient green wheat that's toasted and cracked to bring out its unique flavor. Another ancient grain, quinoa, gets most of the rave reviews, but freekeh has more protein and twice as much fiber as quinoa. A quarter cup of dry freekeh has 7 grams of protein and 8 grams of dietary fiber, making it a plant-based heavyweight in both departments. Beyond keeping you regular, higher intakes of dietary fiber may be a key factor in successful aging. The kind of fiber found in freekeh can also help improve blood sugar control. Freekeh also delivers the same vision-protecting antioxidant duo, lutein and zeaxanthin, found in leafy greens. How to Prepare: You can cook freekeh much the same way you would make a pot of brown rice: Add 1 cup grain to 2-1/2 cups boiling water or broth, cover tightly, and simmer until all liquid is absorbed. Uncracked freekeh takes about 45 minutes to prepare, while the cracked variety takes about 20 minutes. Once cooked, freekeh can be used in salads, veggie burgers, stir-fries, soups, grain bowl recipes, and to replace rice in items like burritos. Kale and Brussels sprouts are already considered nutritional heavy hitters. The latest entry into the super-vegetable lineup are kalettes (think mini kale plants), a hybrid vegetable produced by scientists via seed hybridization—not GMO technology. With a whimsical appearance like that of a badminton birdie, kalettes have a nutty flavour and a less bitter bite than straight-up kale or Brussels sprouts. Like other Brassica family members, kalettes supply an arsenal of health-hiking antioxidants, along with vital nutrients, including vitamin K and vitamin C. Look for kalettes in the produce department alongside items like baby spinach. How to Prepare: Kalettes can be steamed, blanched, sautéed, roasted, or even grilled. Pretty much any recipe calling for Brussels sprouts or kale will work with kalettes. Here's one quick recipe you can get started with: Toss a bunch of kalettes with some oil and roast in the oven at 425 degrees F for about 12 minutes or until outer leaves have turned crispy. Toss with a vinaigrette dressing and chopped walnuts, and serve. Made by pressing whole hemp seeds, hemp oil has a fresh, earthy flavor and brings with it plenty of nutritional perks. It's a reliable source of the essential omega-3 fatty acids alpha-linolenic acid and omega-6 linoleic acid. Both fatty acids are considered "essential" because the human body can't make them. They must be obtained from foods. The ratio of omega-6 to omega-3 in hemp oil is about 4 to 1. This is a vast improvement over the ratio found in a typical Western diet, which can be as high as 20 to 1. Having a skewed ratio like this is suspected to drive up bodily inflammation. Hemp oil also contains compounds with antioxidant properties that may help fend off cell-damaging free radicals. 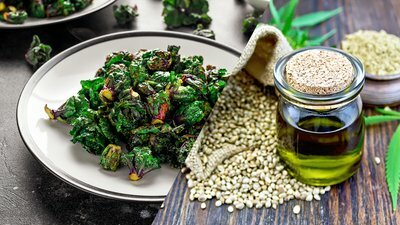 How to Prepare: Hemp oil is too delicate for most cooking purposes, so save it for use in salad dressings, dips, pesto, or to drizzle over roasted vegetables. Once you open a bottle of hemp oil, keep it refrigerated. Gopinath, B., Flood, V. M., Kifley, A., Louie, J. C., & Mitchell, P. (2016). Association between carbohydrate nutrition and successful aging over 10 years. Journals of Gerontology Series A: Biomedical Sciences and Medical Sciences, 71(10), 1335-1340. Humphries, J. M., & Khachik, F. (2003). Distribution of lutein, zeaxanthin, and related geometrical isomers in fruit, vegetables, wheat, and pasta products. Journal of Agricultural and Food Chemistry, 51(5), 1322-1327. Teh, S. S., & Morlock, G. E. (2015). Effect-directed analysis of cold-pressed hemp, flax and canola seed oils by planar chromatography linked with (bio) assays and mass spectrometry. Food Chemistry, 187, 460-468.